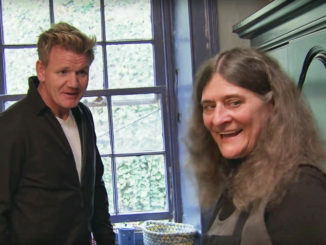 In this Hotel Hell episode, Gordon Ramsay visits Town's Inn, Harpers Ferry, West Virginia, where Gordon finds the most bizarre owner he has ever met, Jason and wife Ana bought the hotel in 2007 as an investment and to keep his mother Karan busy. Karan treats it more as her home than a business and sleeps in her office! Her son has believes her welfare is the most important even if it means she has to no longer be involved or he has to sell. Gordon arrives and finds clutter, hats and freaky dolls for sale but also loaves of bread, which are all out of date! Gordon is taken to his room but finds a selection of wicker baskets for sale at $1-30 that are dusty and covered in bugs! Gordon is in the Potomac Room, named after the local river. The ceiling is cracked, the curtains fall down as the pole is too short and the cupboard is locked as this contains her clothes. He asks for the key, Karan refuses but is willing to open to show Gordon what is in there. Gordon asks for half the cupboard and takes out half of Karan's clothes, they are put in her office on her bed. Gordon heads down to the dining room and orders mac and cheese, fiesta stew and trout. The mac and cheese is split on top, microwaved and has no seasoning, the fiesta stew was made 5 days ago and the trout is watery. He meets Sarah, a close friend who volunteers in the hotel as she likes to fill her time. Gordon discovers Lamont with black bags full of clothes and is puzzled as he only removed one bag from his room. The bags are going to Lamont's basement until she can sort through them. Gordon meets the staff who get annoyed as volunteer Sarah tells them what to do on behalf of Karan, whilst she sits in her office alone. The kitchen has paint on the walls as Sarah wanted them painted and she paints over cracks by putting her business cards on the wall and painting over them but the wall is rotten underneath and Karan appears to justify filling holes with brillo pads. Gordon returns to the kitchen, there are 5 microwaves and 2 chefs.. Gordon is surprised to see that they are boiling pre-prepared burgers, Karan sees no problems with this so takes a customer into the kitchen to see how it is cooked, he was expecting a fresh burger. Gordon asks the young server to take two female customers to show them where the food comes from, and to take the rotisserie chicken and explain that it is 6 months old and store bought. Gordon tells the customers about the origins about their food and shuts down the kitchen. Karan defends the chicken but tells Gordon that she cares about everything. The walk in is filled with old cooked bacon, fries in dirty water, fish stewing in blood and the oven was last cleaned a year ago. The equipment needs replacing but Karan tells Gordon that she is in debt and laughs off Gordon's comments about the faulty kitchen equipment. Gordon uses a bacteria test kit to test the hygiene and the carpet on the floor of his bedroom gives a reading of 803 (30 is safe) but Karan defends the rating and blames bikers and hikers. Gordon refuses to sleep in the room and leaves. As Gordon is leaving, he sees the office sign and Karan tells Gordon that it is her private quarters, he tells her she is not doing one thing right and he cannot help when she is in denial. Gordon returns the next morning, he has hired a professional cleaning crew to declutter and scrub the kitchen. He tells Karan to start packing up a box and meets with Jason to discuss the hotel. Jason tells Karan that he wants to make money and also support his Mom but with no profit, it will have to close as it will drag down his family. Gordon finds a home for Karan to live in, paying the rent out of his own pocket and sends Karan off for a makeover. Gordon reveals her makeover and the makeover of the Inn, the staff are overwhelmed by the changes. The office is now a store, allowing more space in the dining room and the rooms have been given a modern makeover. The menu has been reduced in quantity and simplified and the kitchen has been cleared to maximise the space. On relaunch night, the kitchen is more efficient and the customers are loving the new food. Karan is more proactive as an Inn Keeper and the locals promise to return and leave with goods from the store. Gordon tells Karan to take some time to spend with the Grandchildren. Since Gordons visit, Karan continued with the lease on the house, the staff are helping to make positive changes and Jason has become more involved with the business. Karan has since moved back into the hotel and is living in a room on the second floor. Reviews were mixed since Gordon's visit, more recent reviews on both Trip Advisor and Yelp are mostly very positive. Their website shows a great contrast between those rooms that have been renovated by the show, those that appear to renovated by the owner and those that have not yet been renovated. Town's Inn aired on June 07 and 14 2016, the episode was filmed in November 2015 and is Hotel Hell season 3 episode 3 and 4. That this hotel was allowed to function, serve meals, have guests stay is beyond belief. Where are the health inspectors? Are there no standards in an Inn only 30 miles from Washington DC. Neither the owner or the kitchen staff should be allowed to run an establishment like this. The owners son is responsible for the terrible condition of the place, he has no excuses. Why did they not buy a used-book shop for mother? Good Hygiene is not something you can suddenly discover, it is a way of life. This place will revert eventually to it's former self. I see their facebook page is still up, and I see post after post after post of renovation announcements. Karan shouldn't be trusted with trying her shoes, let alone running an inn! I was gobsmacked at how stubborn and delusional she was, all hiding under a veneer of fake politeness and soft spokenness. Don't be fooled, she is as bitter as they come! Every valid concern Gordon bright to to her, she instantly shot back with a backhanded comment in that quiet little voice of hers, like there was an ocean of anger just simmering under the surface. I really hope she's kept far away from the business, if she's allowed to set even one for in there again it's going to go to right back to the way it was. You can't get into such a bad shape without it being a baked-in aspect of her personality, especially considering not only did she see nothing wrong with what she had done, she threatened to fire anyone who tried to change it for the better. Karan is friggin scary! I don't know if I've ever seen someone as passive aggressive as her. This is the first episode of Hotel Hell that left me feeling queasy, and honestly I have no idea how on earth her poor soon can keep the place afloat after having to pay for the renovations needed to undo the massive structural damage she singlehandedly caused. I feel kinda sorry for her.. I honestly think she has some issues. Like Gordon says, it's not normal what she does and how she lives but she's completely fine with it. If that were my mother, I'd get her checked over by mental health professionals because there's seriously something wrong with her. Not in a very bad sense and I'm not being insulting but she seriously does need a real check. There's just things in the way she talks and acts that would make me worry to high heaven if my mother acted like that. Maybe I'm looking too far into it and she's just like this but honestly, there seems to be a lot more going on and the son seriously doesn't look like he wants to help. If it were my mum that was living like that, I'd rent out a house for her and if I couldn't, she'd be staying with me. I would never EVER let my mum sleep on a wooden board in an Inn she's meant to be in control of. That's not a life for anyone, especially for your own mother. I hope she's doing okay, she's not a bad person at all but something just isn't right. Eww, Karan crapped on the floor. That's nasty. She needs to be in some sort of assisted living. Her mistake is not cleaning or managing the cleaning. Having the accident is embarrassing but not uncommon or should be a cause to insult her as a person (be nice, we're all people and we all have our shameful moments). Wow this episode was disgusting!